After spending a lovely time in Essaouira – did I already mention how relaxing this place is? – we took the bus to Marrakech. This was our last stop in Morocco and we felt that it was a nice combination with relaxed Essaouira. 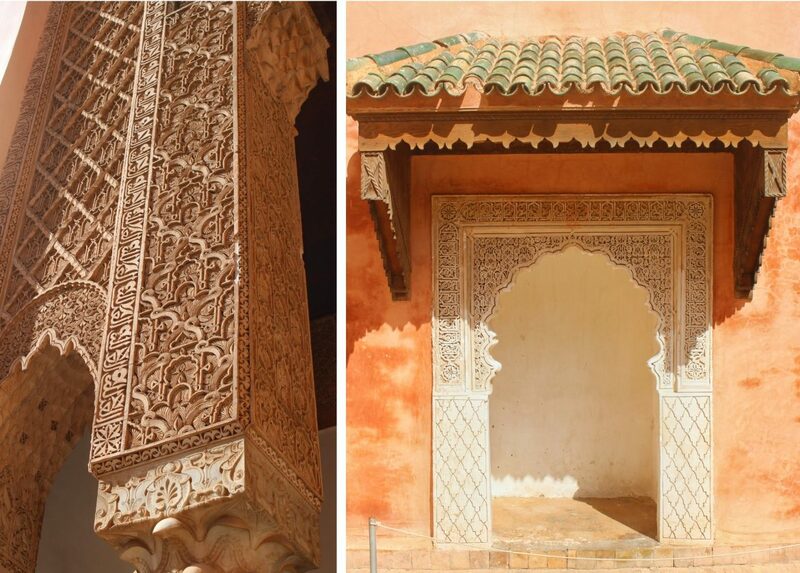 We spent two days in the pink city of Morocco, by far not enough time to see everything there is to see in this city. So, I am not going to tell you about the must dos or the highlights. My stay was too short for that. Instead I focus on my own impressions of this city. What struck me, what surprised me and what were the things I did not like. Here is my random collection of observations and practical tips. 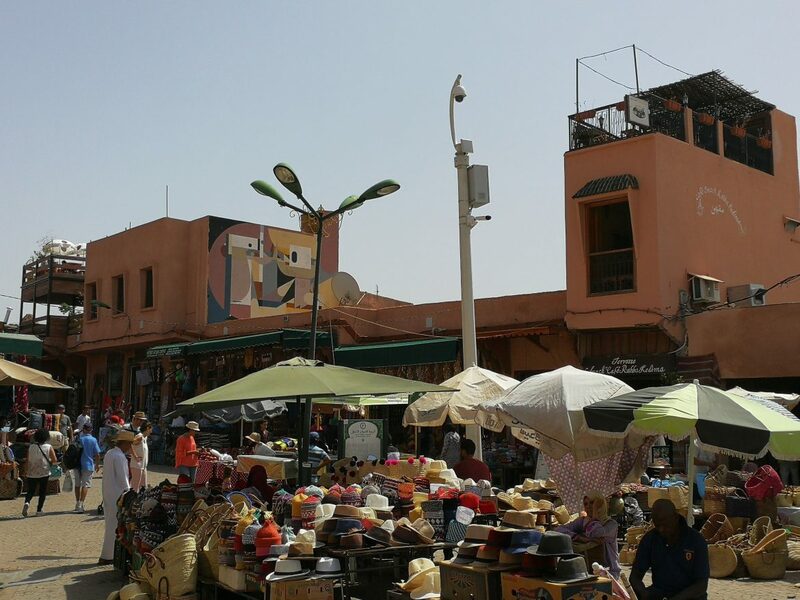 The final stop of our bus drive was the modern train station of Marrakech. 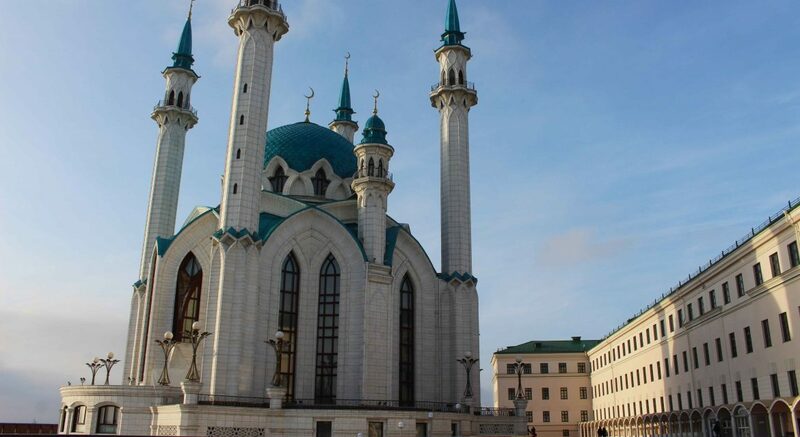 Built in 2008 with a clear oriental look and feel in mind. A beautiful station, but even more beautiful was the artistic greeting on the building in front of the station. A life size black and white portrait of an Aziz trader against an orange background, painted by the German artist Hendrik Beikirch. 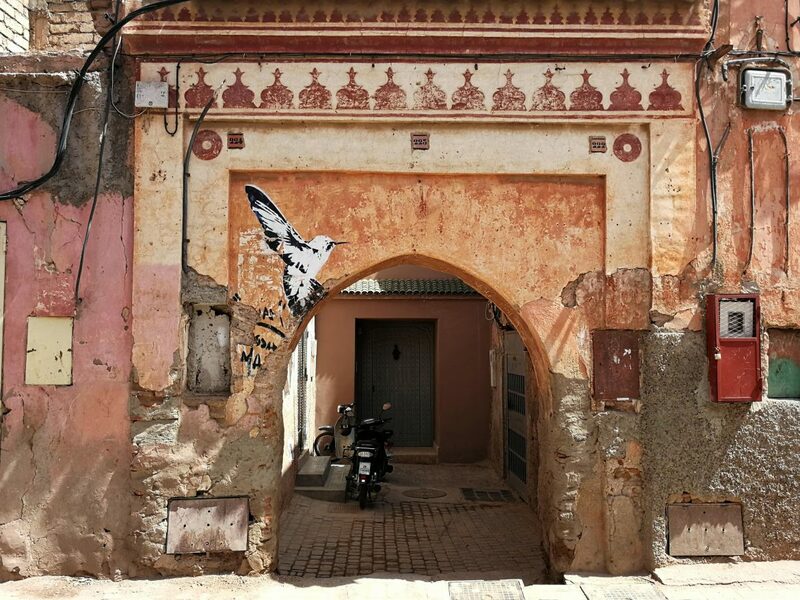 His work is part of a series of wall paintings under the name ‘Tracing Morocco’. Beikirch immortalized faces of the Moroccan men and women he met during his extended stay in this country. 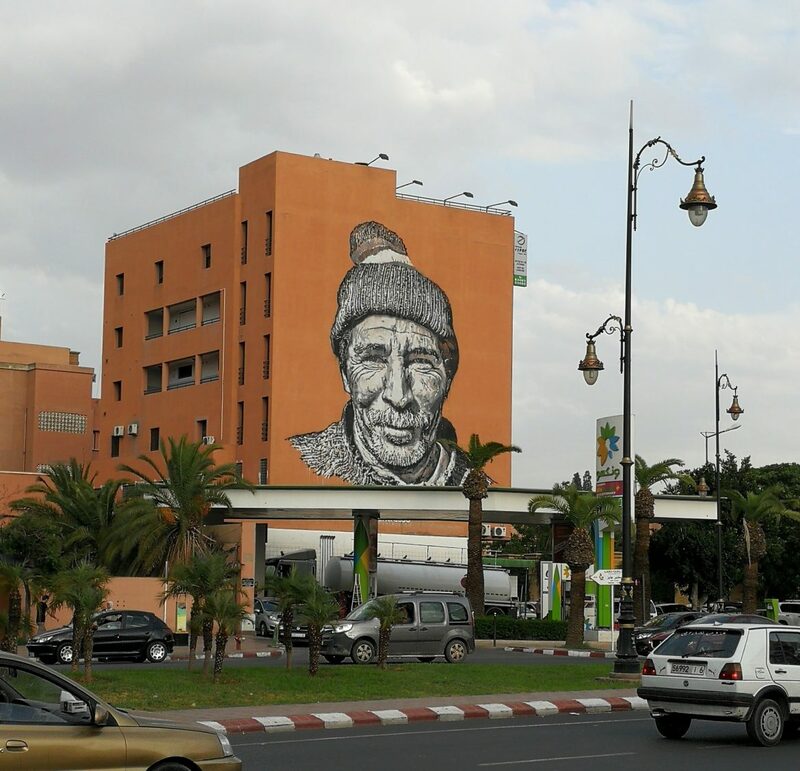 The artist has not only worked in Morocco, you can find his ‘faces’ all around the world. Also in the Netherlands, I have seen his work in Goes. I do not speak French and that is a huge disadvantage in Morocco. Apart from Darija (Moroccan Arabic) French is a popular language and it is almost expected that every tourist is able to speak this language. A lot of people hardly speak English. Basic knowledge of French can definitely help with ordering dishes in restaurants or shopping in the souk. Maybe this sounds a bit harsh, but there is no other way to put it. This square annex market square is a weird combination of innocent juice sellers and shameless animal entertainment. There seems to be no limit to what you can do with animals. Monkeys on a chain, a dozen snakes on picknick blanket, horse carriages lined up too close behind each other to fit more carriages in. All with the purpose to entertain tourists, but at the expense of animals. After five minutes looking around, I decided to get the hell out of there. I did not want to be part of this tourist trap. Taking photos in Marrakech can be challenging. Locals often do not want to be in your photo at all. They will protest or, even worse, ask money for the picture (I did not experience the latter myself). I like taking photos of streets, alleys and sights. But that is hard if you have to avoid snapping locals in your photos. This means that you have to wait for the perfect moment. I actually have never been to a country where taking a normal photo was so challenging. As soon as someone thinks that he or she is on your picture, they will cover their face, wave and start shouting ‘No!’. By the way, I felt that taking photos with my smartphone was easier, because it is quicker. 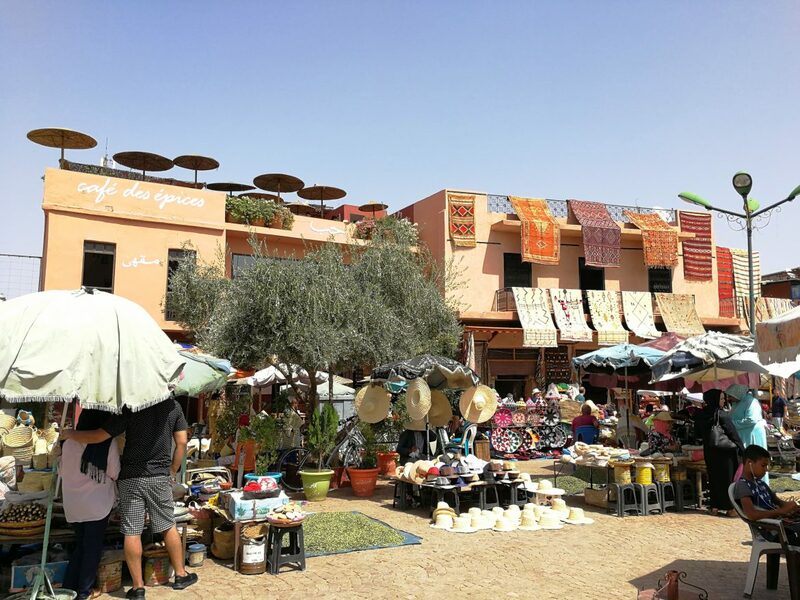 Maybe I was spoiled by Essaouira, but what struck me the most in Marrakech were the large groups of tourists (also a lot of Dutch tourists as well). And of course, all those tourists want to go the same sights, so we spent a lot of time standing in queues. Queued up to buy tickets, queued up inside to actually see the sight. 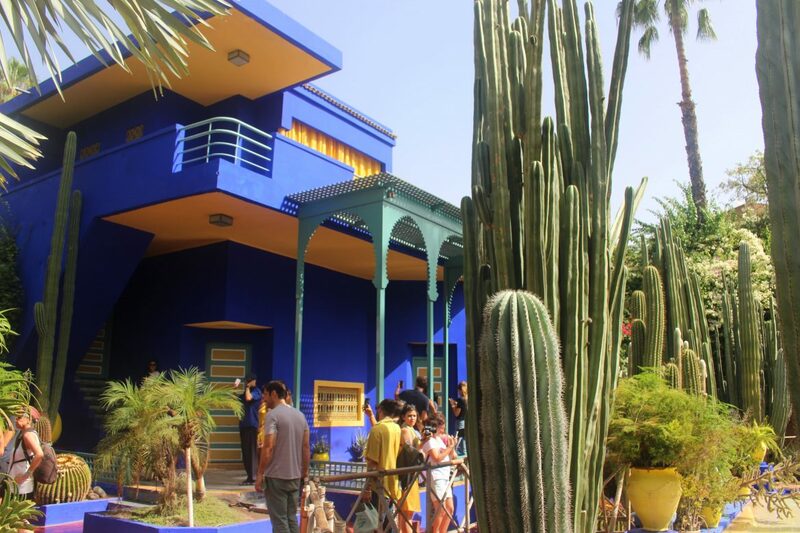 During our stay we visited the Majorelle Garden and the Saadian Tombe. Both beautiful sights, but filled with tourists. At the Garden I even saw garden staff offering their service to snap photos for you, from a spot no one is allowed to go to. I get that more and more people are traveling and I am also one of those tourists, but for me it ruined the experience a bit. Then again, we were there at the end of high season (September), so maybe when you visit it in winter or spring it is better. 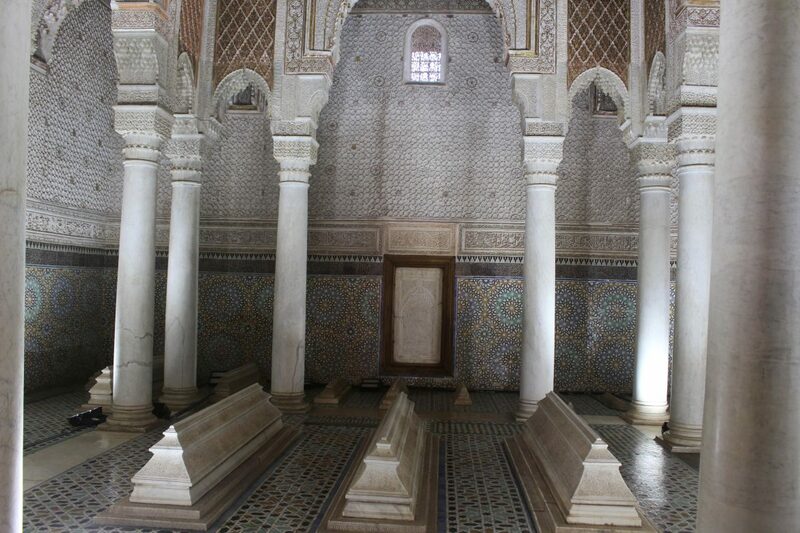 Standing in the queue inside the Saadian Tombe All for this 2-minute look into the mausoleum. 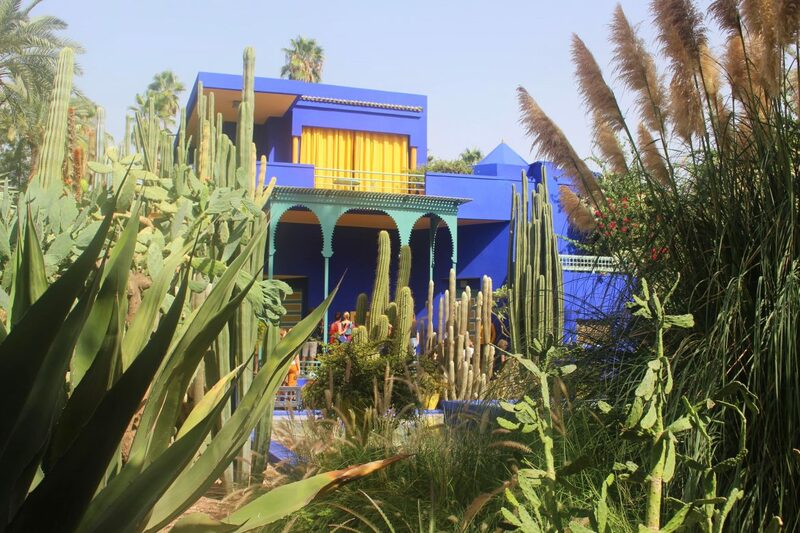 Inside the Majorelle Garden, tourist crowds hidden behind the green of the cactuses But when you approach the Blue Villa, all the tourists are snapping one selfie after the other. 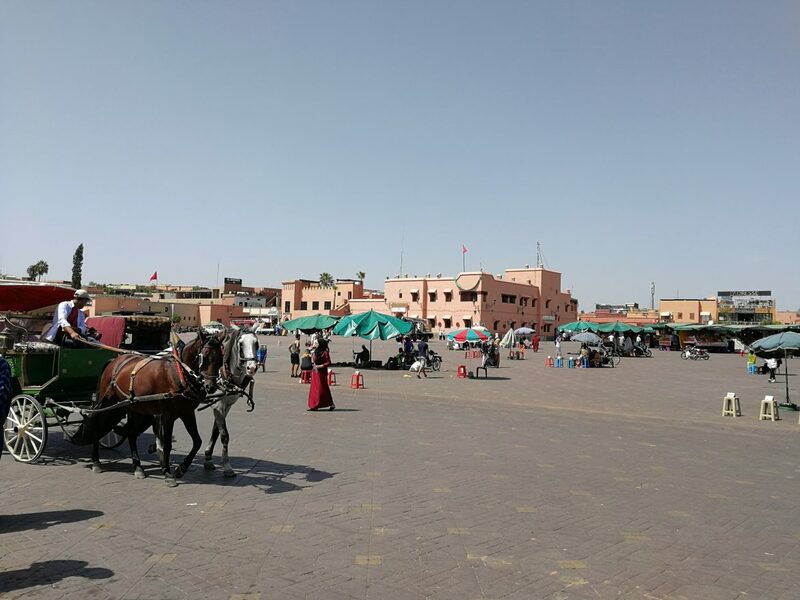 Marrakech is a popular destination, but sometimes it feels like tourists forget in which country they are. 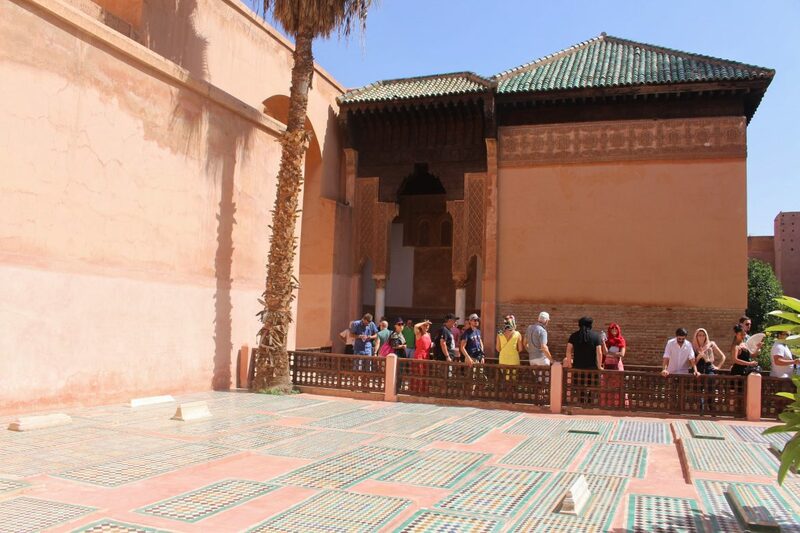 Morocco is a predominantly Islamic country. This means that people dress conservatively: covered shoulders and legs. Ladies, you can leave your short pants and tank tops at home. Instead bring thin shawls and long pants with you. 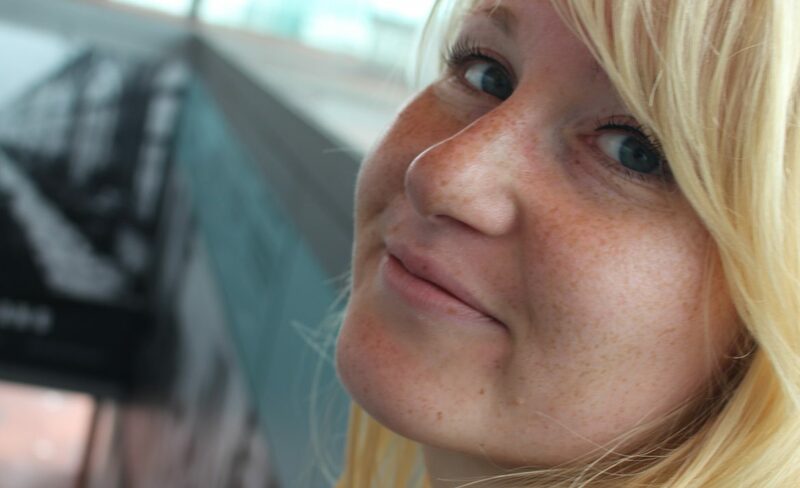 As a tourist you already attract a lot of attention, don’t stand out in a negative way. Dusty roads, narrow city gates, a continuous stream of scooters and a lack of sidewalks or evening lightning. 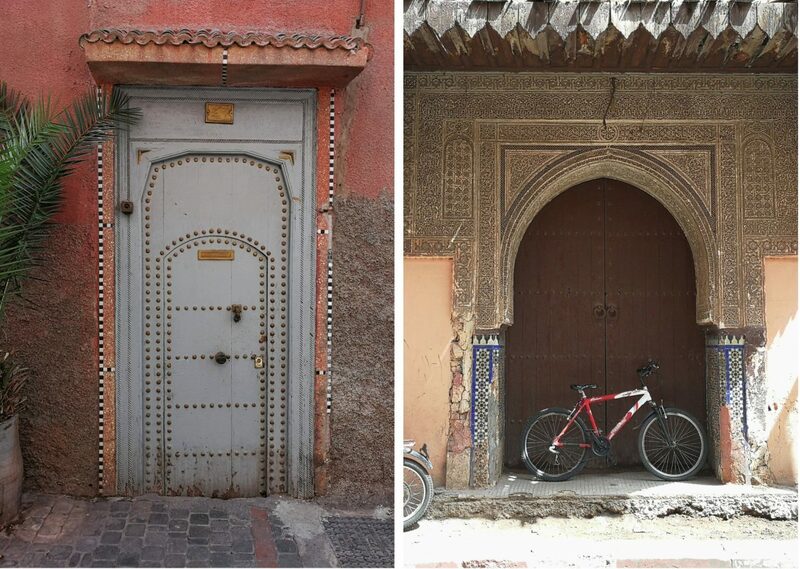 The medina of Marrakech sometimes reminded me of India. Busy, chaotic and a bit overwhelming, but without the cows. In the medina you always have to be alert and pay attention to everything around you. If you don’t, you risk getting hit by a scooter. 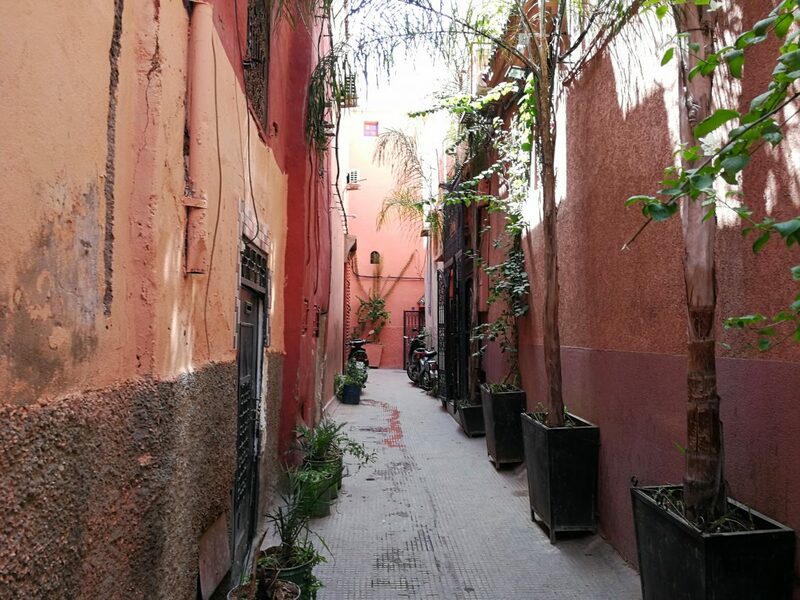 It does not help that the medina, and especially the souks, feels like a maze. Luckily, offline navigation apps like Here Maps or Maps.me offer some relieve. The downfall: you spend more time looking at your phone instead of monitoring everything around you. My boyfriend almost walked into a snake charmer when he was looking on his phone. The road is shut: young Moroccans tell tourists that the road they want to take is shut, but they know an alternative. The idea is that they will guide you and then demand money for the service. Practicing English: someone approaches you in a friendly way and tells you that he wants to practice his English. 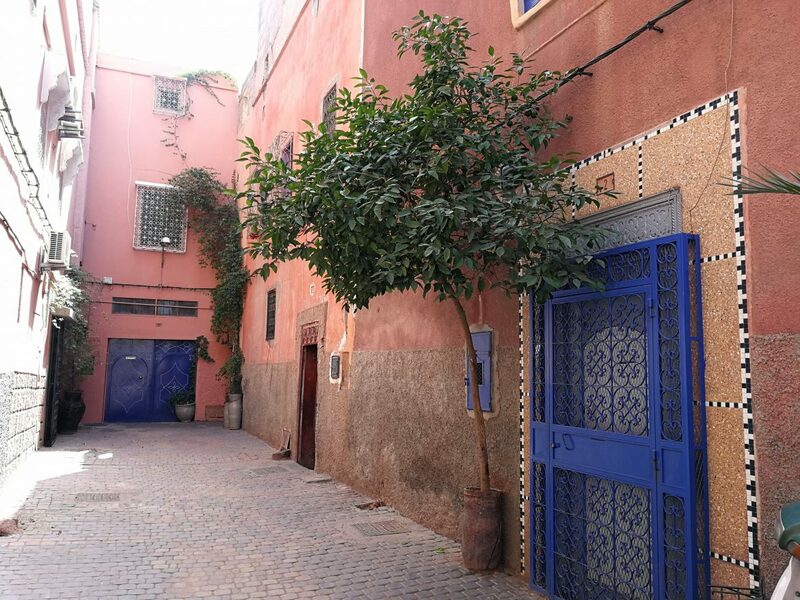 After a short chit-chat he takes you a mini private tour around the medina and drops you off at a shop. Here you will receive tea and the owner will show the best products. The idea is that tourists buy something and the ‘guide’ will get commission. Simple solution for all this: use the offline navigation apps on your phone, say ‘no, thank you’ to the boys and keep on walking. They will get angry and start shouting, because they don’t accept no, but at a certain point they will walk away. 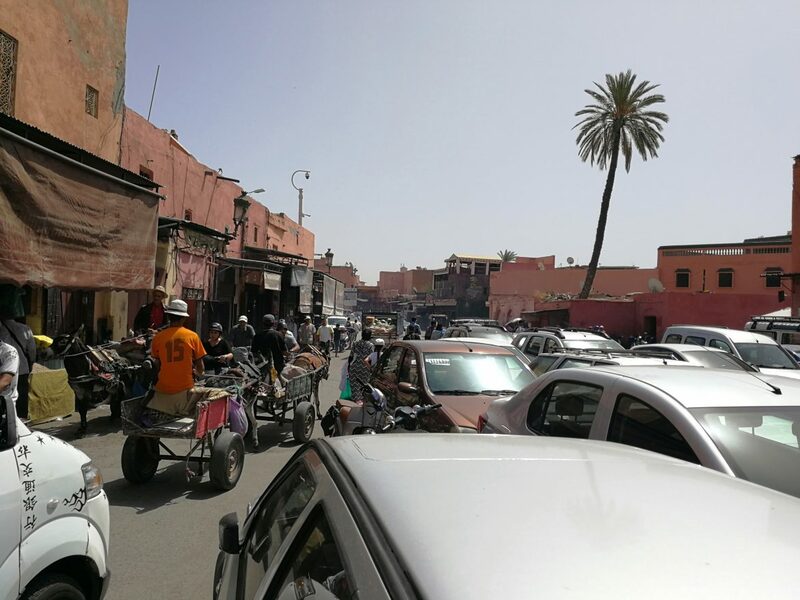 Once you get more and more used to the chaos, you will start to see the beauty of Marrakech. The medina actually does have a beautiful side. For instance, the beautiful red-orange colored streets with fairytale-like doors. 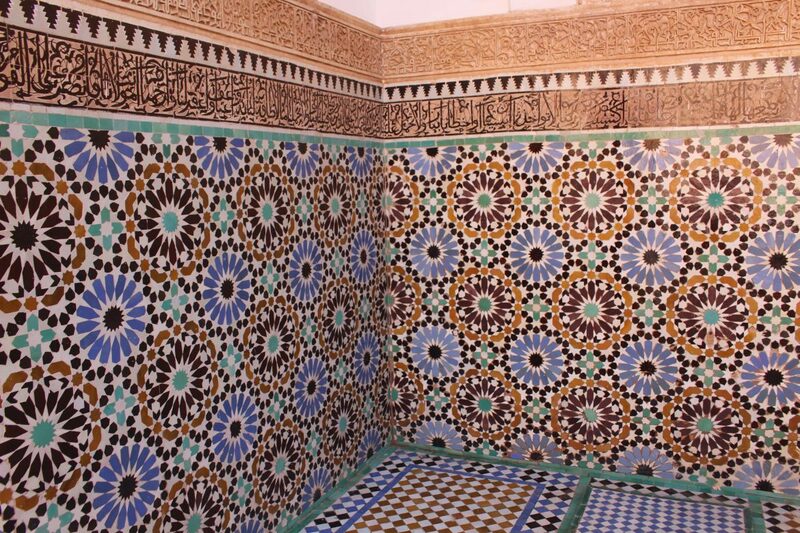 Or the typical green, yellow and blue floral tiles that you see at every sight, no matter if you visit the Ali Ben Youssef Madrasa (temporarily closed) or the Saadian Tombs. And don’t the forget the amazing wood carvings on the bows that reminded me of the Alhambra in Spain. Marrakech is truly charming. Marrakech can be overwhelming for your senses. Choosing the right accommodation is crucial. A place where you can leave everything for what it is, take a step back and relax. 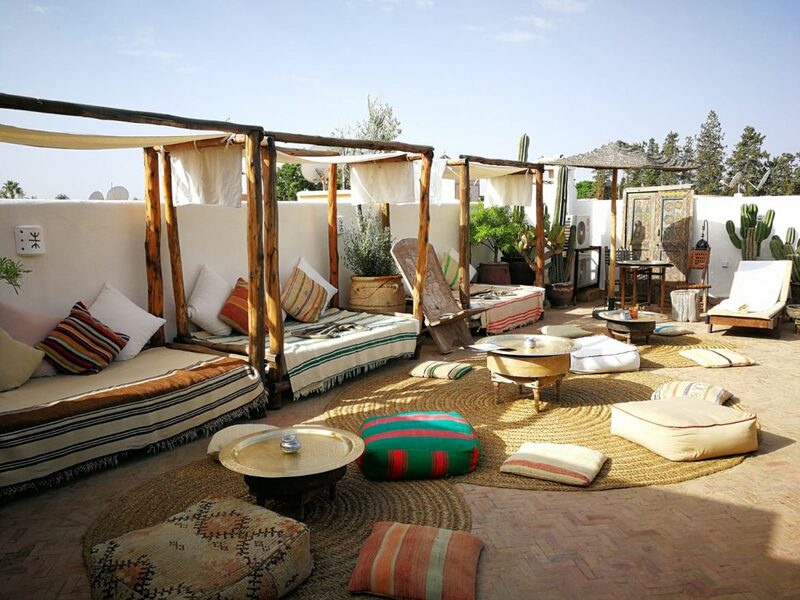 My advice: go for a riad. 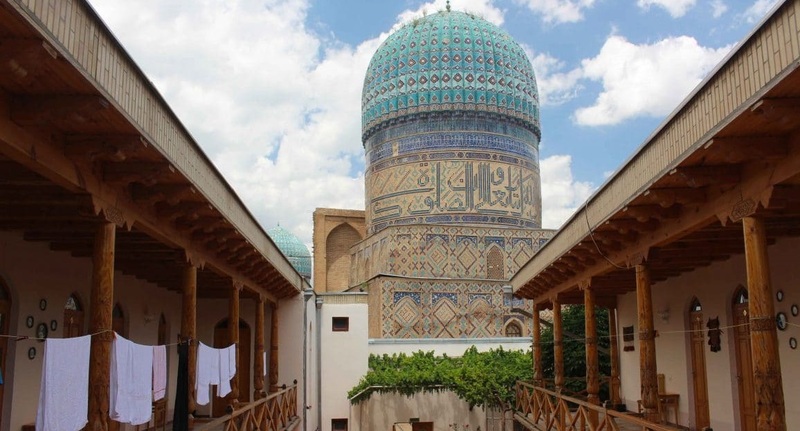 This is a traditional house built around a closed-off courtyard. 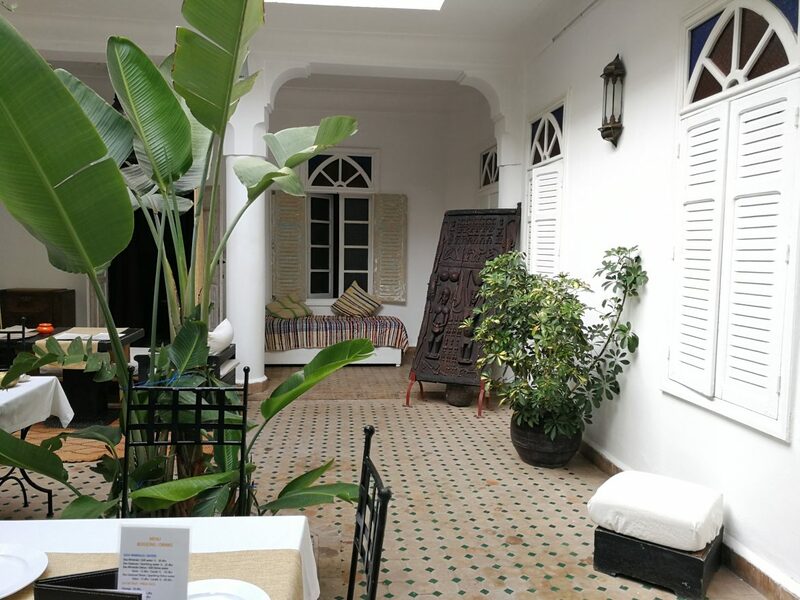 And that courtyard makes the riad an ideal accomodation, because you can still be outside in the medina but without the hustle and bustle of the streets. 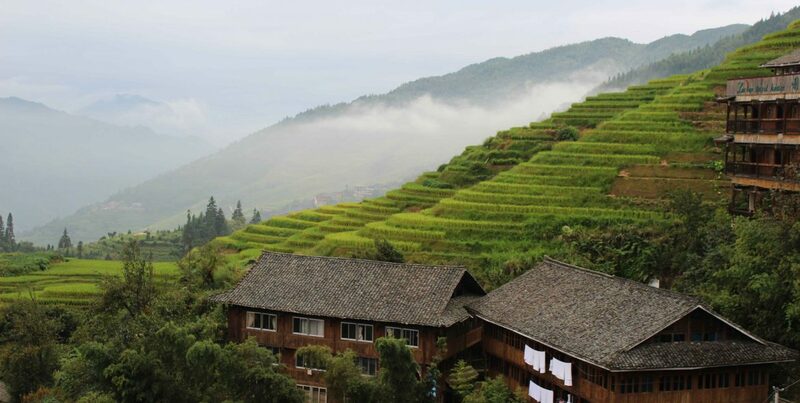 A perfect spot to recharge, read a book or drink endless cups of mint tea. We stayed at Riad Villa Almeria and I can highly recommend it. This post contains affiliate links. If you click on the link and make a purchase I get a small commission to help me keep this blog running. For more information click here. 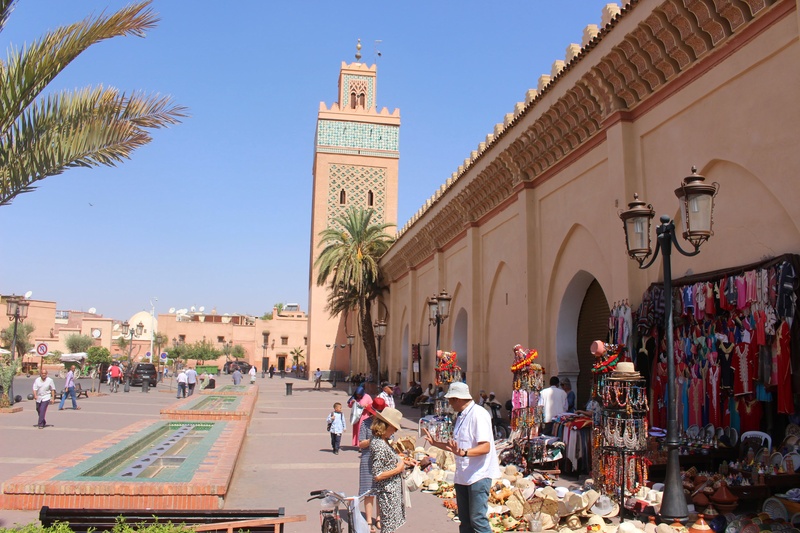 Do you want to go to Marrakech?